Choosing a tablet used to be no-brainner: go to Apple store and buy an iPad . Now it’s more complicated. First in addition to Apple, you have Google Android and even Microsoft Surface. Within Google Android, there are so many brands and sizes to choose from – first from Google and big brands, like Samsung, Amazon, Sony, then Lenovo, Asus, HTC, then some Chinese domestic brands which are little known outside of China, like Ainol, woPad, etc., and all the way to uPlay Tablet , which provides both white label and fully customized tablets to fit your needs. Wow, too many choices. How to choose the right tablet ? We are coming up this series of how-to articles, hopefully to help you make the right choice. The first thing to decide when buying a tablet is the size. How big the screen do you want? So far there are only two aspect ratios in tablet screen: 4:3 and 16:9. Apple has been sticked with 4:3 ratio, while most Android tablets are 16:9. In general, 4:3 fits better for reading and surfing the web, while 16:9 is good for playing movie and video. In term of the screen size, the largest one is 9.7″ (4:3) screen and 10.1″ (16:9) screen. You must ask “why you are saying 9.7″ is the largest, shouldn’t be 10.1″? Well, that depends how to look at the size. The screen size is measured diagonal. Therefore, a 16:9 10.1″ is about the same or actually a little bit smaller in term of area than a 4:3 9.7″ screen. For example, our uPlay Q97 is our latest quad-core 9.7″ tablet with retina display , while uPlay Q10 is our latest 10.1″ tablet running the same hardware. The next size would be 8″. So far all 8″ screens are 4:3, as you see from Apple iPad Mini . Google and the big Android brand haven’t come up any 8″ Android tablets yet, but this size became very popular among Chinese tablet makers. Our uPlay Q8 is actually a 8″ tablet. Another popular size is 7″. Actually most of the Android tablets started from 7″. 7″ is pretty much the largest size that you can hold by one hand (well, you may argue you can hold the 8″ tablets by one hand as well). 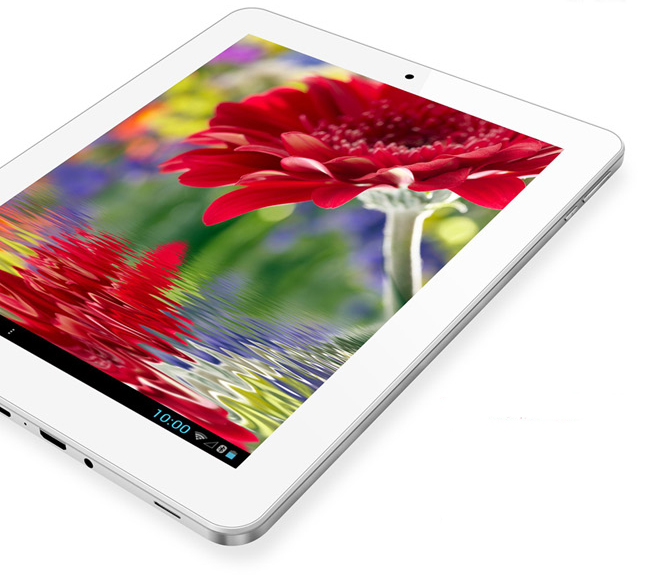 Our uPlay Q7 is our latest white label 7″ tablet for customization. Below 7″ you get into this phablet arena. The popular sizes are 4.3″, 5″ (like our PhonePad 5″) , 5:3″, and 6″. Those sizes are considered as the largest size for putting into your jean’s pocket so you can carry them anywhere. Once you decide the right screen size for you, the next question is screen type. Most people thought all tablets come with the same as what Apple iPad has. That’s right, Apple iPad uses the best and also the most expensive screen. In general there are two type of screen technologies: resistive and capacitive . Resistive touch screen is the original touch screen technology and also the cheapest. It senses the “pressure”; therefore, you have to really touch it with some force. The screen is usually soft, and the original one only support single touch, the latest one supports two point touches. I wouldn’t recommend people to bug tablets with resistive touch, most people feel frustrated with resist touch screen, unless you are building a special device using touch pens. The new touch screen technology is capacitive touch screen. You just have to slightly touch the screen to make it sense your location. In addition, it supports multi-touches. 5-point touch is standard, and 10 point touch is getting mainstream. Not all capacitive touch screens are the same. Some time you see “G+G”, that means the touch screen and LCD screen are both glass, or we call “hard screen”. Apple and most of the big brands are using “G+G” hard screens, but we did see some Chinese tablets are using soft capacitive screen to reduce the cost. Then you have IPS. For those who do not know what IPS is, IPS stands for In-Plane Switching which was developed by Hitachi back in 1996. An IPS display gives you a better display, more vivid color, and a wider angle for viewing. See the comparison below. Then you have “ retina display ”. This term was created by Apple to describe the high resolution screen used in iPhone 4 and iPad 4. Retina Display is a brand name used by Apple for liquid crystal displays which they claim have a high enough pixel density that the human eye is unable to notice pixelation at a typical viewing distance. The term is used for several Apple products, including the iPhone, iPod Touch, iPad, and MacBook Pro. When introducing the iPhone 4, Steve Jobs said the magic number for a retina display is about 300 PPI for a device held 10 to 12 inches from the eye. One way of expressing this as a unit is Pixels Per Degree (PPD) which takes into account both the screen resolution and the distance from which the device is viewed. Based on Jobs’ magic number of 300, the threshold for a Retina Display starts at a PPD value of 53.